There are multiple connection options for using Bose Speakers, such as the SoundTouch models, with Cloud Cover Music. The best option for you depends on how many Bose speakers you would like to stream from and how far apart those are. This article will guide you through single and multiple speaker setup options for wired (aux), BlueTooth and WiFi using the Bose SoundTouch model. Note: Cloud Cover Music isn't listed as a service directly in the Bose SoundTouch app. The following options can be used to connect and stream from any device (computer, mobile, tablet or CloudBox). For Bose speakers that have an audio input port (AUX), one simple option is to plug an auxiliary cable (usually provided by Bose with the speaker) from the 3.5mm jack (headphone/line out) on any streaming device (CloudBox, computer, mobile or tablet) into the Aux In on the speaker. Then select Aux on the speaker and adjust the volume using the app or the speaker volume controls. Bose WiFi speakers can be set up using the Bose SoundTouch App to "Group", which relays the Aux Input from one speaker to other speakers over the WiFi network that the speakers are connected to. The speakers must be on the same WiFi network. To add more Bose SoundTouch speakers, use the Bose SoundTouch mobile app, select the speaker that the device is plugged into (Aux), select Aux, then add the other speakers to make a group. Bose makes a Bose SoundTouch Wireless Link Adapter that can be also be used to connect the Aux cable then relay to all Bose SoundTouch speakers on the same WiFi network. It can also be used to connect a wired system in combination with the Bose wireless speakers to have the best of both worlds! 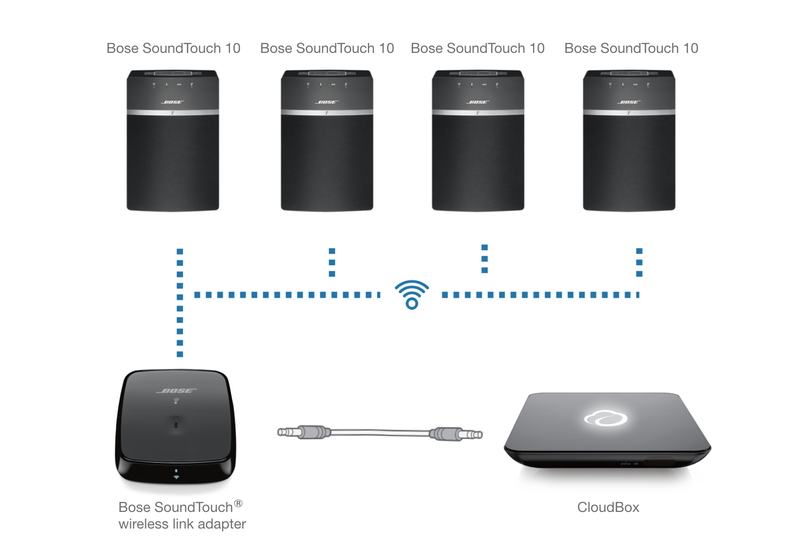 See the section below on how to set up a CloudBox on multiple speakers using a SoundTouch Wireless Link Adapter. BlueTooth is a simple, wire-free way to stream wirelessly from any device (computer, phone, tablet or CloudBox) that is playing Cloud Cover Music. Note: BlueTooth does have range limitations (varies by manufacturer and the environment) and can sometimes suffer from interference. WiFi may provide a more stable connection with wider range, depending on the strength and stability of the WiFi network. Configure the streaming device (CloudBox, computer, mobile or tablet) to connect to the BlueTooth speaker, which should be listed in the BlueTooth section on the device, and make sure the Bose speaker is set to BlueTooth. Bose makes a Bose SoundTouch Wireless Link Adapter that can be used to connect a device using BlueTooth which then relays to the other Bose SoundTouch speakers. It can also be used to connect a wired system in combination with the Bose wireless speakers to have the best of both worlds! How to set up a CloudBox on multiple speakers using a SoundTouch Wireless Link Adapter. After you set up the CloudBox to your Wi-Fi network, insert one end of the 3.5 mm AUX cable provided by Bose to the Audio In connector on the Bose Wireless Link Adapter and the other end to the Audio Out connector on the CloudBox. Next download the Bose SoundTouch Controller app on your smart phone or tablet and follow the instructions in the Bose SoundTouch app to install the Adapter and speakers on your wireless network. Once installed, on the SoundTouch app select the Bose Wireless Link Adapter as the speaker (which is a bit counter-intuitive as Bose refers to this as a speaker) and select Aux as the source for the CloudBox to stream music. Next, add your other Bose SoundTouch speaker(s) that are on the same WiFi network to make a speaker Group. The picture below shows the grouping of speakers and the Aux selected on the Wireless Link Adapter. The volume levels can be controlled as a group or individually. You can add as many Bose Wi-Fi speakers on the same wireless network as you want to the SoundTouch app and play the same music on each speaker. You can also use the Audio Out from the Adapter to plug into another speaker, receiver or a Music On Hold system. If you wish to play different music on each speaker, please be sure to upgrade your account with Cloud Cover Music Zones support. Read more about playing different music in each room. If you require assistance with setting up your streaming device or establishing a streaming connection, please use the chat feature in the bottom right of this page. You can also e-mail support@cloudcovermusic.com. or call our customer support line at (844) 422-6249.